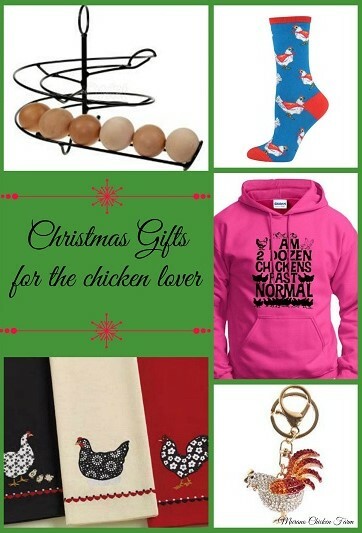 15+ Awesome holiday gifts for the chicken lover! It's cyber Monday so what does that mean? Time to do some serious Christmas shopping! While chicken gift items are much easier to find in stores recently (especially places like TSC!) I find most of the best gifts online. I've been saving ideas up just for this time of year and I think I've found some pretty good ones. We've all seen the henbags, the chicken care books and crazy chicken lady signs so I tried to find the most unique chicken lovers gift items I could.....let me know how I did! Home To Roost embroidered kitchen towel set. Definitely the cutest set I've seen so far! Chicken boots! These red chicken printed sloggers are my absolute favorite chicken boots! They also come in yellow and are available in women's US sizes 6-10. However if you don't need boots where you live, they do have a clog style slip on. Or just get both...you'll need them! Egg Skelter: What better way to display and store your eggs then an egg skelter? Easy way to keep eggs in order of how you collected them. First in, first out! I like the black, but it's also available in red or cream. There's even a small egg version for banty eggs! Egg Slicer: Here's a funny story for ya....even before I lived out here on the farm and had chickens I had this adorable egg slicer and all his friends! The egg timer, mini spatula, whisk, yolk separator and mini fry pan all have adorable egg shaped faces on them and sit on a shelf above my kitchen sink! We have the whole set. Is that weird? Need a gift for your chickens? Check out this list of gifts to make the whole flock happy! If you're into the whole farm life homesteading thing I've also compiled a Homesteaders Holiday Gift Guide on my other blog so head over there and check it out. If you find something really cool that I've missed let me know in the comments below! I had no idea there were so many cute chicken things! What cute ideas! There are so many fun chicken items out there. Thanks for sharing on the Country Fair Blog Party this month!